The English novelist, Edward G. Bulwer-Lytton, actually said, "Love thou the rose, yet leave it on its stem." 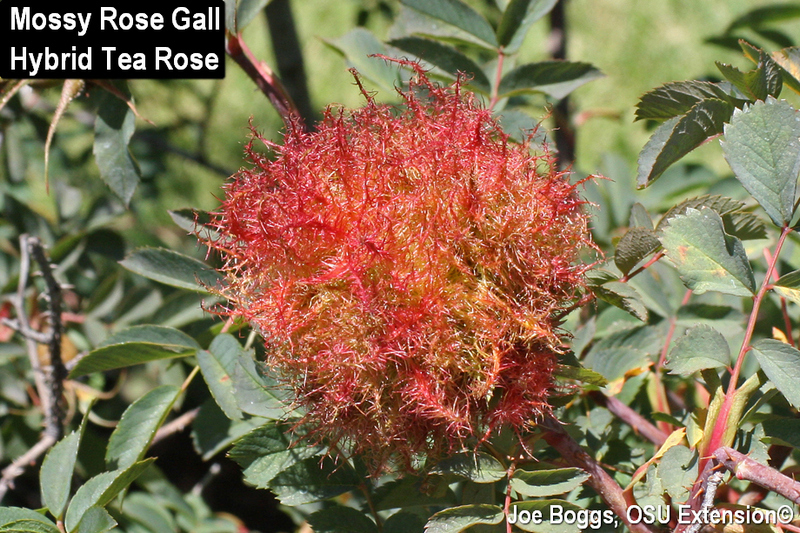 I adjusted his quote to illustrate how to control bizarre looking mossy rose galls. The hairy-looking galls are produced under the direction of the gall-wasp, Diplolepis rosae (family Cynipidae). Ridding roses of the galls rids them of the wasp. The wasp occurs both in Europe and North America and will produce their characteristic galls on several species in the Rosa genus. They are most commonly found in Ohio on hybrid tea roses; however, I've also seen them on multiflora rose. Old galls look like a ball of moss stuck on the rose stems, thus the common name. Cutting the current galls open will reveal individual chambers, each housing a single wasp larva. The overall size of the gall depends on the number of larval chambers. Single-chambered galls usually measure less than 1" in diameter. Multi-chambered galls may measure over 2" in diameter, filaments included. The wasps have one generation per year. Females initiate gall formation when they use their ovipositors (= stingers) to insert eggs into leaf buds in the spring. The resulting wasp larvae exude chemicals that further direct gall formation. The galls change color from light green to crimson red as the wasp larvae mature. Late instar larvae spend the winter in dark reddish-brown galls and new adults emerge in the spring. Spent galls become grayish-brown and often remain attached throughout the season. As with most plant galls, mossy rose galls cause no harm to the overall health of their rose hosts. In fact, I believe they add ornamental value to roses, but I may be gall-biased: love thou the rose gall. Of course, if the galls detract from hybrid tea display roses, just apply my adjusted form of Bulwer-Lytton's quote. The gall-makers can be effectively managed by pruning and destroying developing galls. What a pity.